So with the first cake of my Great British Bake Off odyssey under my belt, I was ready for the first technical challenge. 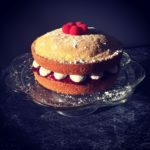 For the very first technical challenge in Great British Bake Off history contestants had to make a Victoria Sponge cake. Sounded easy enough. I’ll be honest I was really excited about this challenge because it seems so quintessentially British. I also like the look of the Victoria Sponge cakes. They’re simple yet elegant. 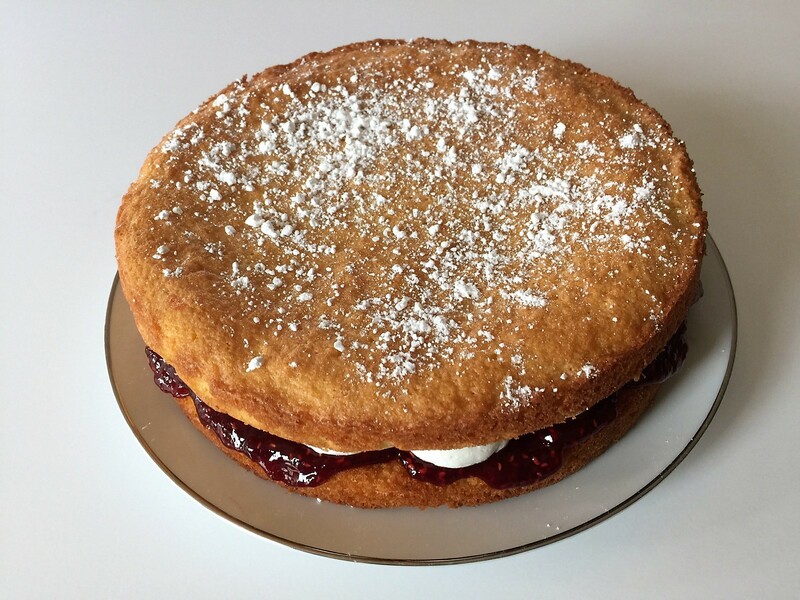 Victoria Sponge Cake is considered the quintessential English teatime treat. This cake earned its’ namesake from Queen Victoria herself. Apparently, she liked to partake in a slice often at her afternoon tea. During the early Victorian period, seed and fruit cakes were served at tea time. 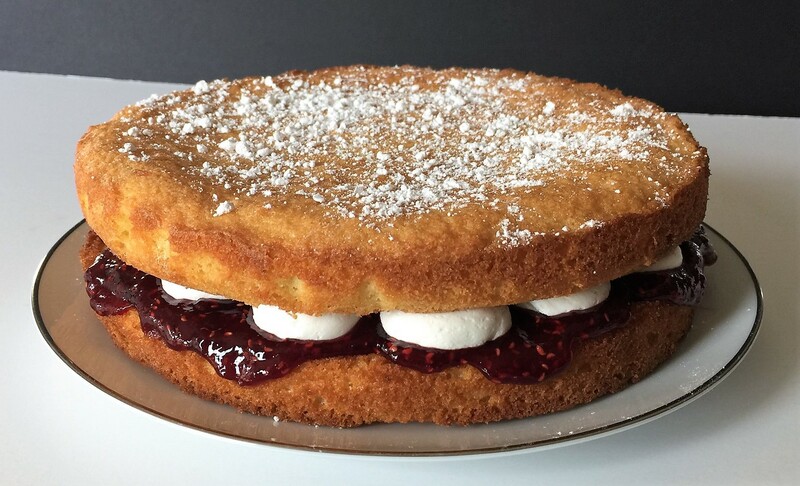 Because it was considered dangerous for children to eat cakes containing fruit or seeds, the Victoria Sponge was prepared for them. The adults took inspiration from the kids’ table and began to enjoy Victoria Sponge Cakes themselves (I would have done the same!). You can now tell your mom you learned something today. So with the confidence, I moved onward and attempted Mary Berry’s cake recipe. What could go wrong?… apparently a lot. I made the first cake and it looked alright but once you bit into it, the cake was dry, dry, dry! This could not be how Mary Berry intended a cake to be. I mean I suppose I’ve never tried a Victoria Sponge before so I’m not sure of the texture, but dry as gunpowder couldn’t be right so I decided to try again. Check out the first attempt below. The cakes are just kind of limp and weak looking. Not awful but not good. Here’s another view. However, before I tried again I went out and bought fresh flour and baking powder. With new ingredients and a renewed confidence, I tried again. I watched the cakes rise beautifully only to pull them out and have two upside down frisbees in front of me. Two boulders had apparently broken into my oven and mushed my cakes down. This time I didn’t even bother with buttercream. At this point, I got pretty disheartened because I realized that I would have probably been kicked off the first episode of the first season of the Great British Bake Off. I will say that of the three cakes this one tasted the best. I stood over the stove and shoveled bites of buttery goodness into my mouth. However, I had invested too much butter into this endeavor to settle for anything but a show quality cake. Now I’m going to let you in on a little secret for which I’m a bit ashamed… I decided to ditch Mary Berry’s recipe and try a different one and you know what… it turned out beautifully. It was light and buttery and paired perfectly with my mom’s homemade raspberry jam. Oh yeah, did I mention my mother is a master canner? Her stuff is award-winning… literally! More on that later. So I sandwiched buttercream and raspberry jam in between the cake layers and then ate it up. Check out the finished project below. I topped the cake with some fresh raspberries for flair. I piped the buttercream into little kiss shapes because I liked the look of it. However, my husband said they look like marshmallows, which I suppose he’s right. I don’t care though, I like things to look bulbous. Let me know if you have had luck with Mary Berry’s recipe. I am sure I am doing something wrong that should be a simple fix. I also heard that people argue about what should be layered in between a Victoria Sponge. Should it be exclusively clotted cream, whipped cream, strawberries or raspberries? If you have a certain tradition please let me know in the comments below. This buttery cake is a tea time favorite for a reason... it's delicious. Preheat the oven to 375 Fahrenheit/ 190 Celcius/ 170 Celcius Fan/ Gas Fan. Grease and flour two 8 in/ 20 cm baking pans. Place the butter, sugar, and vanilla extract into a bowl and beat well. Once at a creamy consistency, slowly beat the eggs in one by one. Then fold in the flour and mix well. 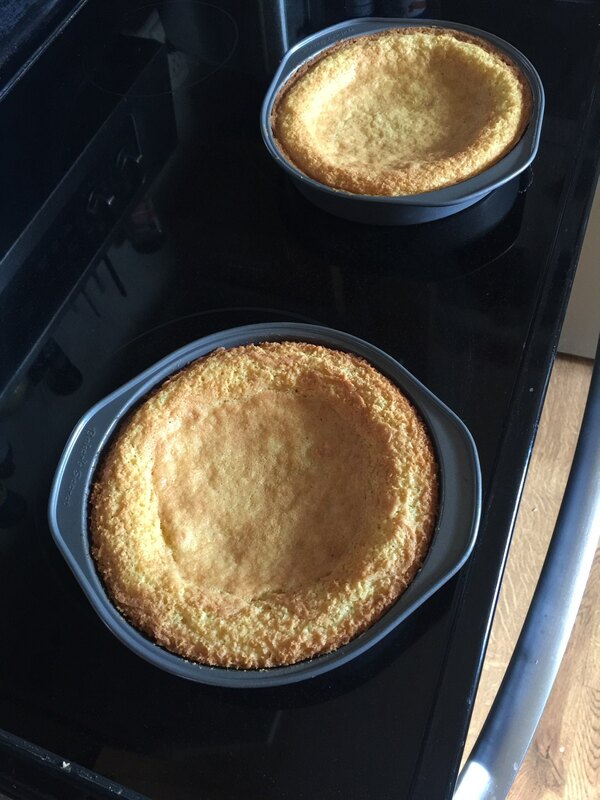 Divide the mix between the cake tins, place into the oven and bake for about 20 mins until risen and golden brown. When done, remove the cakes from the oven and allow to cool for 5 mins in the pan, before turning out onto a wire rack and cooling completely. Spread the jam onto one cake and then top with the filling of your choice - either buttercream or whipped cream or nothing but jam. Sandwich the cakes together and dust with icing sugar.